It was that time of year again – our annual road trip to Detroit for the 2016 North American International Auto Show. As for our chariot, we got our hands on an eighth-generation Japanese mid-size sedan with 300 horsepower and barely 300 km on the odometer. Finished guessing? The automobile in question is none other than the Nissan Maxima and boy, has it gone through a major revision for 2016. Compared to the outgoing model, the Maxima appears to have eaten a few red mushrooms and gained a few levels. 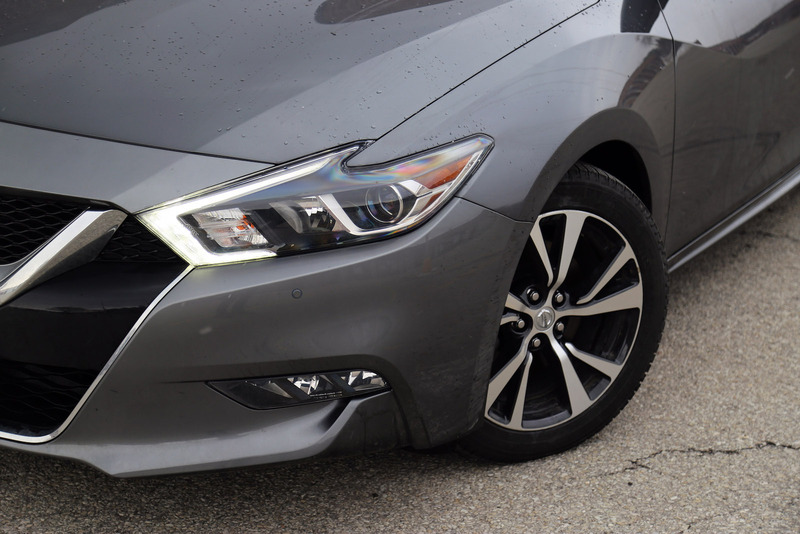 Not only is it better looking and more luxurious than before, but the Maxima seems to have stumbled into the ring where entry-level luxury sedans usually reside. Nissan calls it a four-door sports car. 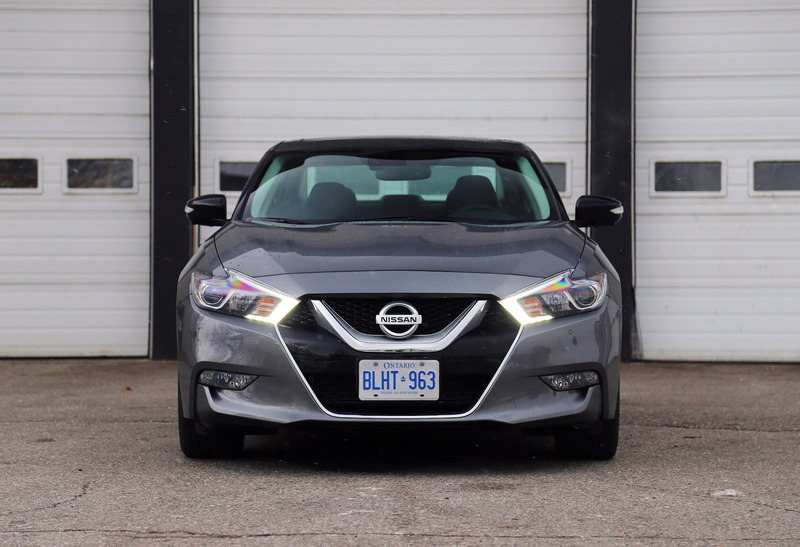 Designed accordingly, the new Maxima has been completely reconstructed with an aggressive V-shaped front end, boomerang headlights, and an illusive floating roof design. Additionally, the Maxima is now 33 mm lower, 56 mm longer, and rides on a lighter and more rigid chassis than the previous-gen model. 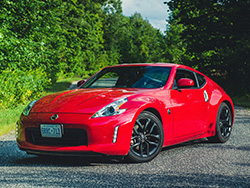 Matched with a wide stance and sports car profile, Nissan has followed an unconventional formula but has somehow made it work. 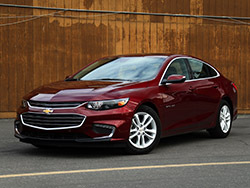 While many might not agree with the flamboyant front nose and sharp creases, the beautifully sculpted profile and bowtie-shaped taillights dish out a unique image that certainly won't be confused with any other sedan on the road. Grandma won't be calling it a Honda no more, especially with that pair of aggressive looking exhausts completing the rear ensemble. 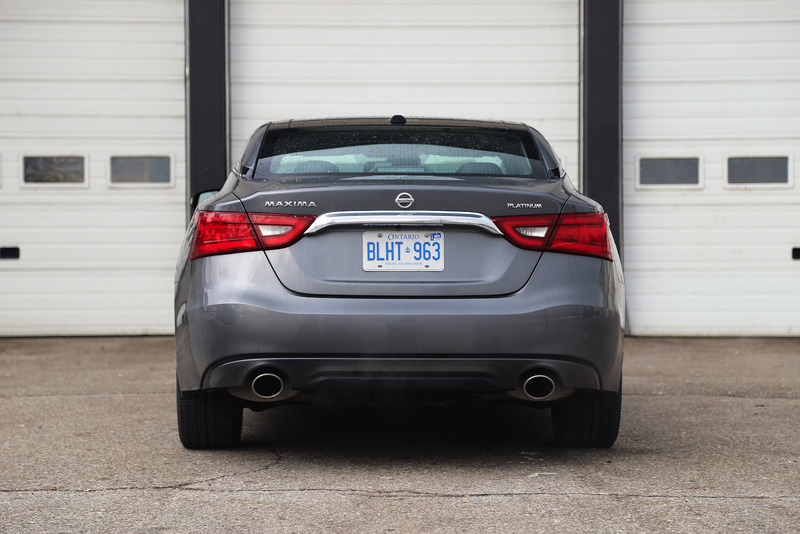 At this price point, the new Maxima is quite a bargain when compared to similarly spec'd competitors such as the Ford Fusion, Acura TLX, and Mazda6. One might even cross-market shop with the new BMW 3-series – the paragon that Nissan is squarely aiming at. Truth be told, Nissan stands a good chance of stealing those customers away. Part of that reason is because they have nailed the new interior. The Maxima’s cabin smells, feels, and looks like an Infiniti, and that’s not a bad thing at all. We were just in a QX50 last week and the familiar knobs, buttons, and even diamond-quilted leather seats give it a luxurious feel that would make you do a double-take on price sheet. 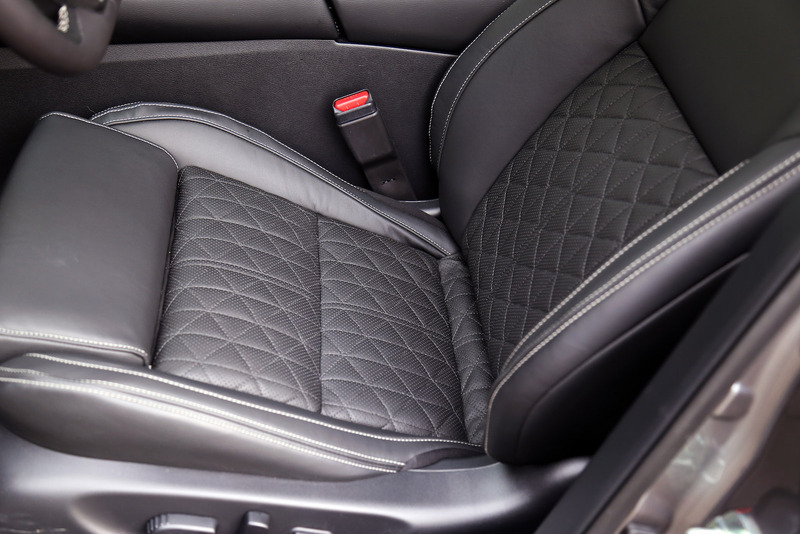 Interior engineers said the inspiration came from an airplane’s cockpit, everything from the flat-bottom steering wheel, gauges, and gear shifter to the switches and controls. Even the infotainment screen is meticulously angled towards the driver. 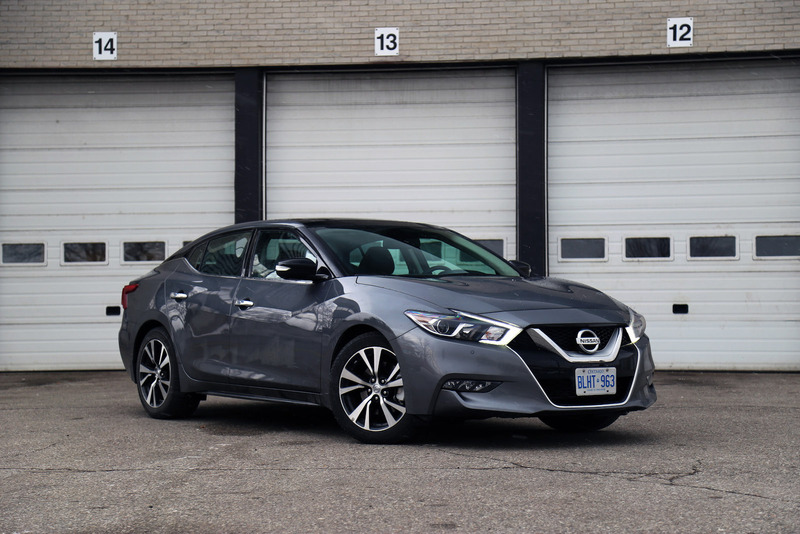 In truth, the new revisions are a night and day improvement over the outgoing Maxima: clean, refreshed, modern, and decidedly more upscale than what the price suggests. Of course, we were a bit spoiled with the top-end Platinum trim that loaded up our Maxima with diamond quilted leather seats, a dual-panel moonroof, driver’s seat memory, and a rear window power sunshade… wait what? The Maxima gets a rear sunshade? A few years ago, this sort-of-excessive feature was only reserved for $100,000 luxury sedans like the BMW 7-series or Jaguar XJ. Now you can have a rear sunshade in a Maxima for nearly half the price. That, ladies and gentlemen, is how you attract an audience. We’ve done nothing but praise the Maxima’s interior so far, and it deserves applause for such a job well done. 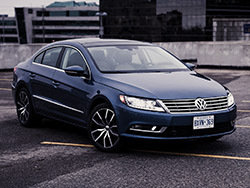 But we can't finish our review without revealing any gripes or annoyances that we've experienced with the vehicle. Firstly, that sloped roofline. Even though it doesn't affect ingress and egress out of the rear seats, it does affect rear headroom. Standing 6-feet tall, I have to purposefully slouch my back so my hair doesn’t rub against the headliner. Furthermore, only small children will be able to sit comfortably in that middle seat – best to call this a 4+1 passenger sedan. On the bright side, legroom is quite decent and that massive trunk will swallow anything you throw into it. But when you picture a four-door sports car, you think of a sedan with a wide stance, maybe a V6 or V8 engine, a rear-wheel drive setup and a traditional manual transmission – excuse me? The Maxima has a CVT? And it’s front-wheel drive only? Well that’s a shocker. But try not to judge a car by its spec sheet resume - the Maxima masks its underlying economy-car foundations fairly well. Powering the front wheels exclusively is a revised 3.5-litre V6 that enthusiastically produces 300 hp and 261 lb-ft. The V6 is the same design from last year but Nissan says they’ve used 60% new parts to squeeze out an extra 10 hp and also increase fuel economy. Modifications include a sodium-filled exhaust valve that was inspired by the one used in the GT-R, reshaped intake valves, a revised intake manifold, and a stiffer oil pan. So it’s got power – what about the gears? More like lack of gears because the Maxima is mated to Nissan’s new Xtronic transmission, a fancy way of saying CVT. This one has been tuned to mimic an automatic and it’s actually pretty good at it. Delivering distinctive shift points in manual mode with a wider gear ratio spread, novices might not even notice the lack of shifts or rubberband effect (where pressing the accelerator makes the engine rev to a high rpm, but only after a second or two will the car pick up speed). Surprisingly, the new CVT is plenty of fun to drive and I don’t think I’ve ever enjoyed one this much before. Although it does drone during hard acceleration, leaving it in Sport Mode and selecting “gears” with the shifter feels very engaging. The bottomless pit of power and grunt from the exhausts further assists in hiding its gearless origins. But the main advantage from the CVT is the amazing fuel economy that follows suit. Over the course of our roadtrip, though mainly highway, we averaged a respectable 9.0 L/100km. The new Maxima also houses a massive 68 L tank, allowing you to spend less time at the pump and more time on the road. Admittedly, 300 horsepower is a lot for two front wheels to handle by themselves. There’s no all-wheel drive option either. Floor the gas pedal from a stop and you’ll notice the torque steer and tire squeal as you fight to keep the body straight. But once you get going and apply wide-open throttle, the Maxima manages to grip well, pull up to the 6,400 rpm redline, and brake confidently. 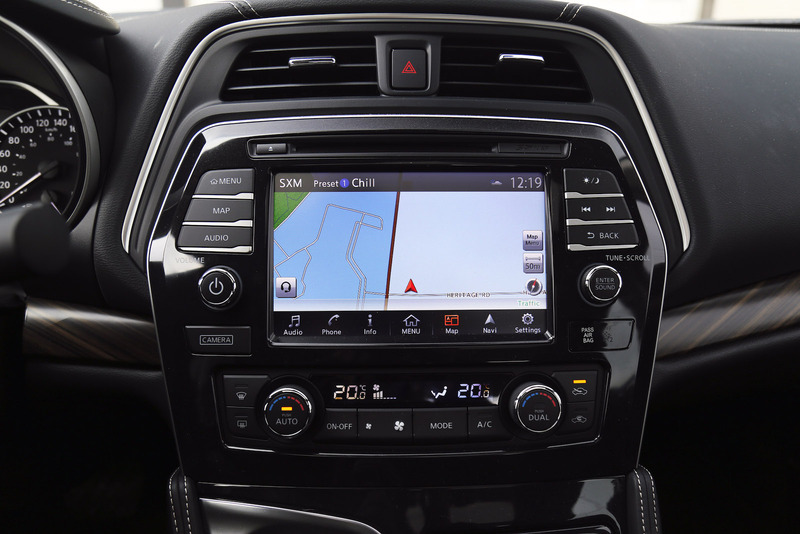 The driver also has the ability to select the driving mode between Normal and Sport. Sport will improve engine response, tune the transmission for more aggressive shifts under hard braking, the weight of the steering gets heavier, and more sound gets piped into the cabin (fake, but get over it). This is the mode to use 24/7. In Canada, there are four trims available. We are not going to ramble on about the options in each trim – you can read the lists here – but we are going to tell you which ones we recommend. Our favourites are the SR ($41,100) and Platinum ($43,300) trims, but they appeal to very different buyers. Let us explain. 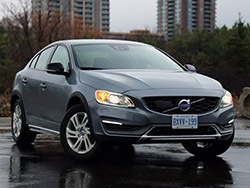 SR is the sportier trim for the type of person who wants the bona fide embodiment of a sporty four-door sedan. SR offers a sport-tuned suspension and front chassis performance damper similar to the one used on the 370Z Nismo sports car, the deletion of the moonroof for better rigidity and a lower center of gravity, Alcantara inserts and paddle shifters on the steering wheel, larger 19-inch wheels (compared to the 18’s on the Platinum) and aluminum sport pedals to finish off the glamour. Platinum on the other hand is for the soft rider, the buyer that wants to arrive in style but doesn’t exactly want to rip the tarmac or go H.A.M. on the straights. This trim includes a dual-panel moonroof, premium Ascot-leather seats with diamond quilting, mahogany wood panels, a multitude of safety systems, a 360-degree camera view, a rear window power sunshade, driver-side memory seat, heated steering wheel, and ventilated and heated front seats. 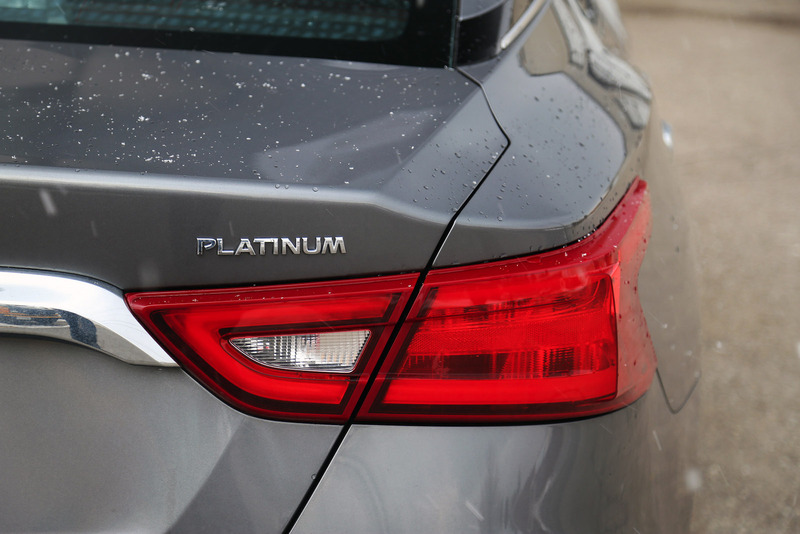 The Platinum is less 370Z, and more Infiniti Q70. Either choice will keep the wallet heavy and smiles rampant, but if the quilted seats and fancy tech doesn’t strike your fancy, then the base model SV ($35,900) would be our pick of the litter. Armed with standard leather seats, navigation, that brilliantly retuned V6 engine, and the sporty CVT in disguise, you really can’t go wrong with any Maxima. And we couldn’t have asked for a better workhorse to take to Motown. The Maxima provided a plush, comfortable, and well-appointed ride like no other mid-size sedan on the road. Taking inspiration from jet fighter cockpits and redesigning it with an athletic V6 engine, a plethora of safety equipment, and a good amount of utility, Nissan’s sports sedan formula has certainly paid off. Even though we've put more than 1,000 kilometers on the clock and spent more than 24 hours driving, dining, and napping with the Maxima, we're truly sad to see this one go. Among the many cars that we're lucky enough to test each year, our experience with the Maxima will certainly be one for the books. For the Chinese review, click here.